This entry was posted in low-FODMAP / frucmal elimination diet [now] and tagged abdominal discomfort, bloating, elimination diet, fructose malabsorption, IBS, IBS-like symptoms, low-FODMAPs diet, polyols, sorbitol, tummy troubles by Aglaée Jacob, MS, RD [radicata nutrition]. Bookmark the permalink. If you can find a vegetable that works for you, I’d try to just eat it for a while instead of trying different things. I can eat kale cooked with leeks. I sautee them together in either butter or toasted sesame oil. Sometimes I add a little GF tamari. I can also tolerate potatoes very well, but I know you don’t want to eat much of those. I probably need to cut back on them to loose weight, but it’s hard. I hope you can find a veggie that you can tolerate. Glad you felt better fast! I’m new to your blog, but have you tried green beans? I can seem to eat canned ones well, frozen…not tested much – but I know not all can eat them. What good does the coconut oil do for you? I tried 5 green beans last Friday for dinner and I was sick, but I think it was due to the almonds… or maybe the nori sheets? I tried these 3 foods on the same day, not a very smart thing to do! Maybe I’ll give them another try and make sure it is the only “new” food I have that day to make sure. Greens beans are easier to find than kale for me here. Coconut oil is a good fat with so many good properties. One of them is that it is antimicrobial and since I had a parasite infection and many antibiotic treatments, I think it can help. Also, it is a very good source of energy, especially if following a very low-carb diet like I am and it helps you stay in ketosis, or fat-burning mode. 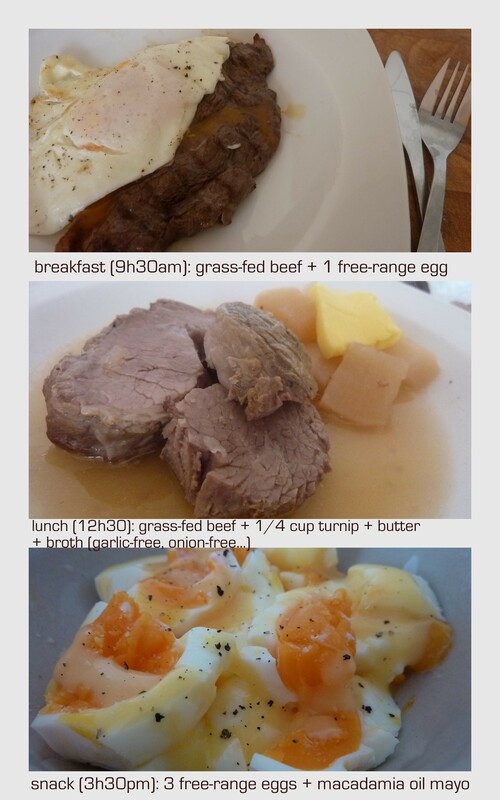 At about my 6th or 7th day all-protein and fat and no FODMAPS, I was soooo sick. I felt almost motion-sick, made it home just in time to vomit violently :S It passed just as quick thankfully. But I almost lost faith in my diet change. And a few days after I broke out all over in pustules. Things felt all wrong for the first two weeks but it’s great now. Thanks for sharing, I hope I won’t go through that! Good to know you are feeling better now.